What is the story? Three minstrels, three Purim spielers, come to a city called Shamgorod in the Ukraine. It is Purim eve, and they want to perform a play in order to get food and drink. In most of Wiesel books he writes as a witness of the Holocaust. His voice reminds the world of the importance of remembering. This play by Wiesel is no different. 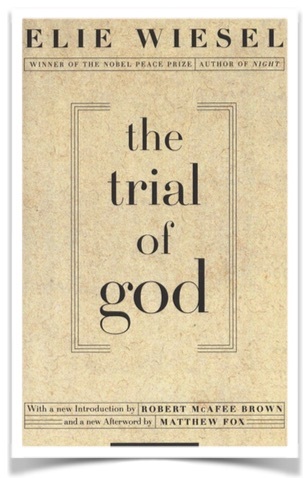 Wiesel shows us that it is fine to question God, fine to challenge, fine to even be angry. Anger and questions do not necessarily mean a lack of faith nor a crisis of faith, neither are they sacrilegious. In the face of tragedy, and so very much in face of the horrific hell that Wiesel and others experience in Auschwitz and Nazi Germany, it is understandably a part of mans wrestling with God. What I so deeply love about Wiesel’s writing is not the answers he gives but the questions he raises – questions that have no pat answers, no easy resolution. I will be pondering this read for a good while to come. They are modest, my requests, and humble. I ask You what I might ask a stranger met by chance at twilight in a barren land. I ask you, G-d of Abraham, Isaac and Jacob, to enable me to pronounce these words without betraying the child that transmitted them to me: G-d of Abraham, Isaac and Jacob, enable me to forgive You and enable the child I once was to forgive me too. 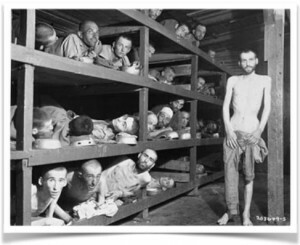 5. photo credit – Jewish Virtual Library – Weisel is in the second row of the bunks, seventh from the left. 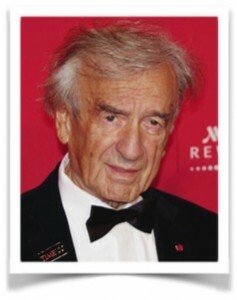 Elie Wiesel is the recipient of the Congressional Medal of Honor and the Nobel Peace Prize, and is Andrew W. Mellon Professor in the Humanities at Boston University.